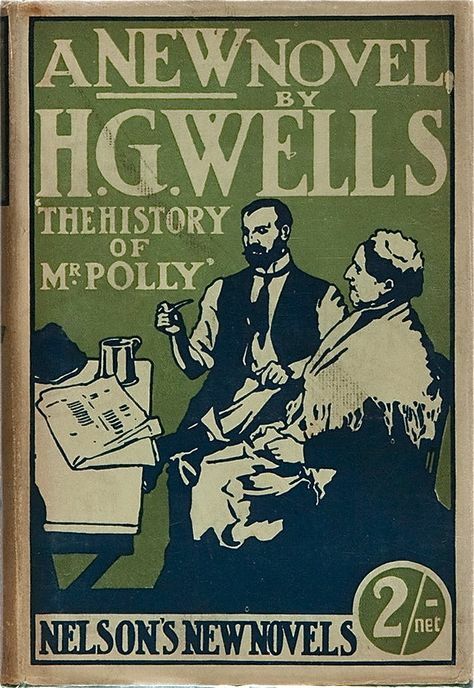 I’ve just turned the final page of The History of Mr Polly, one of H. G. Wells’ non-sci-fi novels. It is Escapological. Mr Polly is a member of the provincial lower-middle class. He is poorly educated (set up, like most of us, to join the workforce or else serve as cannon fodder) but likes to read and is at heart a romantic chap. He carries a secret anger at his obvious destiny to marry his cousin (something which sends shiver down the spine of the modern reader, but all Wells really means by this is “someone nearby and of similar stock, no soulmate”) and to open a small shop. He is also frustrated by the apparent acceptance of other people to this same lot. When he laments it in public, he meets with the usual “know your station!”- and “no point thinking you’re going to escape”- and “ooh, I should be so lucky to have time for books!”- type remarks. He had been a fool, a coward and a fool, he had been fooled too, for no one had ever warned him to take a firm hold upon life, no one had ever told him of the littleness of fear, or pain, or death; but what was the good of going through it now again? It was over and done with. I like that “safety did not matter” remark. Even today people talk about “risk” as if (a) there weren’t perfectly valid and orthodox career paths available within those apparently risky — usually artistic or entrepreneurial — lines, and (b) forgetting that “risk” is only to flirt with failure while settling for safe mediocrity is failure; it’s like deliberately throwing yourself off a cliff when you’re afraid of falling. Cometh the hour, Polly bungles his suicide and ends up burning down his shop and some other buildings on the street. In so doing, he saves the life of the deaf old woman who lives next door and is championed a hero instead of an arsonist. He is also given insurance money for the shop. The drama of all this and Polly’s realisation that his actions (albeit unintentionally) led to change wakes him up from his previous assumption that one’s future is already decided. But when a man has once broken through the paper walls of everyday circumstance, those unsubstantial walls that hold so many of us securely prisoned from the cradle to the grave, he has made a discovery. If the world does not please you you can change it. Determine to alter it at any price, and you can change it altogether. You may change it to something sinister and angry, to something appalling, but it may be you will change it to something brighter, something more agreeable, and at the worst something much more interesting. There is only one sort of man who is absolutely to blame for his own misery, and that is the man who finds life dull and dreary. There are no circumstances in the world that determined action cannot alter, unless perhaps they are the walls of a prison cell, and even those will dissolve and change, I am told, into the infirmary compartment at any rate, for the man who can fast with resolution. I give these things as facts and information, and with no moral intimations. And Mr. Polly lying awake at nights, with a renewed indigestion, with Miriam sleeping sonorously beside him and a general air of inevitableness about his situation, saw through it, understood there was no inevitable any more, and escaped his former despair. Why had he never thought of clearing out before? He was amazed and a little shocked at the unimaginative and superfluous criminality in him that had turned old cramped and stagnant Fishbourne into a blaze and new beginnings. (I wish from the bottom of my heart I could add that he was properly sorry.) But something constricting and restrained seemed to have been destroyed by that flare. Fishbourne wasn’t the world. That was the new, the essential fact of which he had lived so lamentably in ignorance. Fishbourne as he had known it and hated it, so that he wanted to kill himself to get out of it, wasn’t the world.